We started our school year here on Sycamore Hill back in January. We've been trudging along following a rough "Sabbath Schooling" schedule (that's 6 weeks on, 1 week off) and this week finally hit our 100th day of school! The kids have been so excited counting down and wanted to have a big party to celebrate. While that didn't quite happen (parties are fun for kids, but lots of work for mamas! 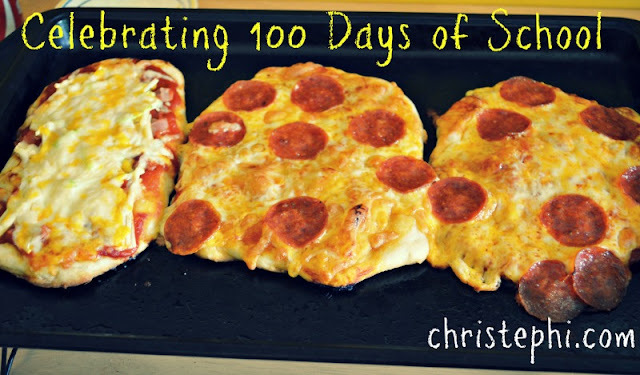 ), we did celebrate with a little 100 pizza! We each got to put the toppings on our numeral just how we like it. I had a shredded zucchini and a little leftover ham on mine with extra sauce. Miss M had light sauce and pepperoni on hers and Mister E had regular sauce with pepperoni and extra cheese on his. He thought it was funny that his "pepperonis" slid down the cheese and off the pizza during baking! After lunch we went to the park. We were supposed to meet some friends there, but they thought it was going to rain and headed to an indoor venue instead...and since neither of us are living in the 21st century (i.e. we do not have smartphones), we weren't able to communicate our whereabouts and missed out on playing together. Oh well, I think the kids had fun anyway. 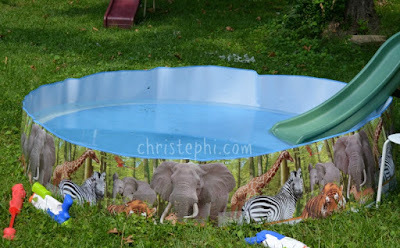 The best part, according to them, was that when we got home they got to go swimming in their little pool! It's an 8' by 18" wading pool with a kiddy slide going into it. I call it the poor man's water park! I didn't get to any of the other amazing 100 days of school activities I have saved on my Pinterest board dedicated to the topic (I really wanted to do the 100 days smarter t-shirts! ), but there's always next year, right?